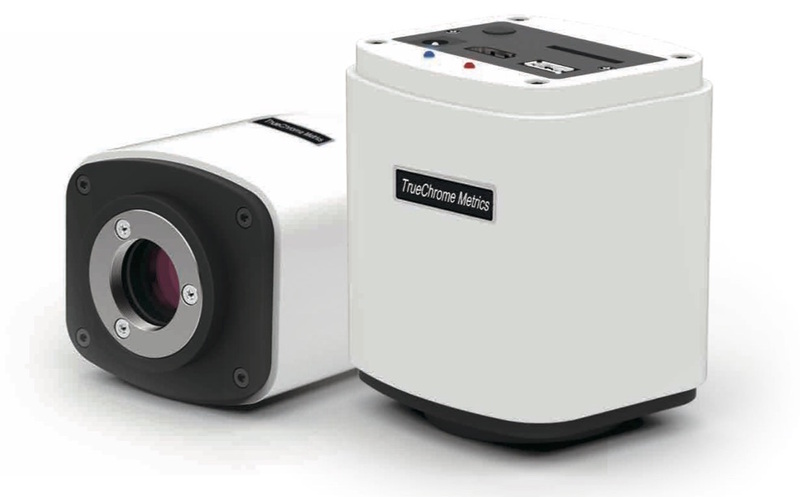 The new TrueChrome Metrics camera from Stemmer Imaging provides fully integrated digital image capture and measurement for micro and macro scientific and industrial imaging applications with no need for a PC. By plugging a mouse into the camera and connecting the HDMI camera output to a monitor, a wide range of multiform measurement tools allows measurements to be made on the high quality images produced. The camera is capable of delivering measurements with a resolution of 10 nanometres to provide outstanding metrology capabilities in the most demanding situations. High quality images are generated by the 2.3 MPixel Sony Exmor CMOS sensor, which delivers live colour images at 1080p 60fps to the connected monitor. This allows the user to smoothly manipulate live images without any monitor lag. Up to 6 MPixel still images and Full HD video sequences can be recorded directly and replayed from a connected SD card along with measurements. An image compare mode also allows for side-by-side comparison of live and previously stored images. With exposure settings from 1ms to up to 10 seconds and 20 levels of gain adjustment, the camera can be used for a host of applications including low light fluorescence imaging. An incredibly efficient 3D noise reduction system overcomes any increase in noise associated with longer exposure times to guarantee sharp images containing plenty of detail. Automatic optimisation of camera settings optimises image quality whatever the application. Exposure time, saturation and automatic white balance produce high quality images with minimal need for manual adjustment whether for bright field bio imaging or dark field birefringent crystal imaging. Full manual control is available should it be needed. The extremely powerful built-in measurement functionality includes: freehand lines, rectangles, polygons, circles, bicircles, angles, point-line distance and much more. In addition to the ability to measure point-line distance, angles, the length of curves and lines, the camera can measure the perimeter and area of enclosed features such as: rectangles, polygons, and circles. Results can be exported as Excel or text files to the SD card. The camera can be readily calibrated and up to 10 calibration files can be saved for different microscope or lens configurations. Quantitative measurements can be made in µm, mm and cm to support both micro and macro applications. The embedded user interface is incredibly easy to use. There are only two icons on screen, one for image capture and the other for the settings menu. The measurement menu appears simply by right clicking anywhere on the live image. For users who prefer integrated PC control instead of standalone operation, the camera can also be connected and controlled directly to a computer via a USB2.0 cable and is supplied with a professional imaging software application that provides complete camera control, advanced image processing functions such as high dynamic range, focus stacking and image stitching, as well as the full range of image measurements, archiving and management.